An urgent appeal to the UK Government has come from a leading bishop in Iraq desperate for help to rebuild homes in a Christian town devastated by Daesh (ISIS) extremists. 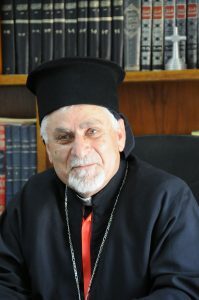 In an interview with Catholic charity Aid to the Church in Need, Archbishop Petros Mouche highlighted the struggle to rebuild homes in Qaraqosh (Baghdeda), the largest Christian-majority town in the Nineveh Plains. With thousands of Iraqi Christians finally returning to Qaraqosh after more than three years in exile, Archbishop Mouche said that the Christian communities were slowly “coming back to life”. He paid tribute to Aid to the Church in Need and other organisations which have prioritised rebuilding homes in Qaraqosh and nearby villages to enable the return of families wanting to rebuild their lives in Nineveh after Daesh forces were forced out in autumn 2016. ACN has played a key role in the repair of more than 6,300 damaged homes in Nineveh but a further 14,000 have yet to be rebuilt. Speaking out against the Iraq government authorities, the prelate said that “the positive change that has occurred in our region” was achieved without help from the state. In summer 2014, Daesh militants forced hundreds of thousands of people to flee when they invaded Mosul and Nineveh – and 120,000 Christians sought refuge in nearby Kurdish northern Iraq with thousands of others fleeing abroad. He said that funding, foreign investment and job opportunities were essential and that requests for “major projects” to be launched in the region had been made. The archbishop hit out against what he called weak and ineffective government, warning that it might prompt more Christians to leave. He said: “There is not one specific party with plans to attack Christians. Archbishop Mouche added: “The Church as a whole is sparing no effort to claim the rights of its people and to secure an area where we can live in dignity and peace.